With Thanksgiving just around the corner, our first thought is not what we are going to cook but what we are going to eat the food on! 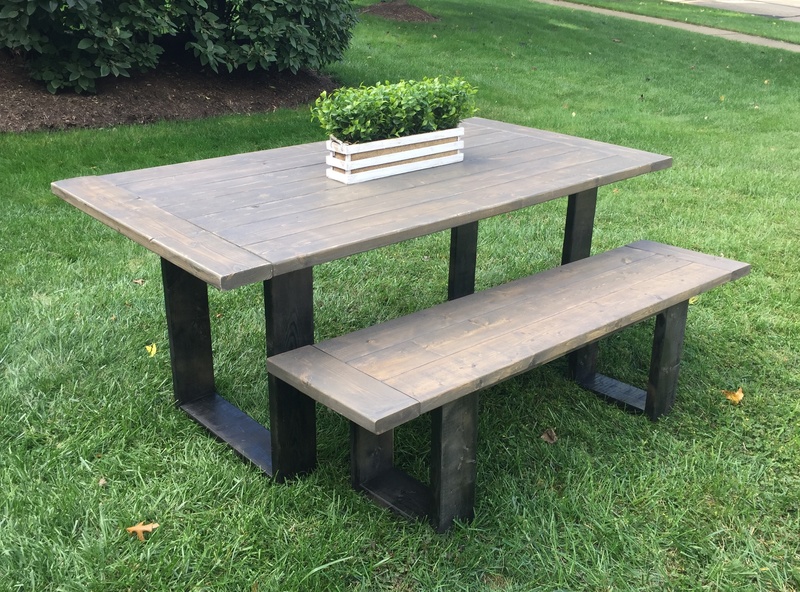 We designed this simple Rustic Modern Dining table that you can build with only 12 2x6x8 boards – that’s about $50 in lumber! Check out our How-To Youtube video, below, to see just how simple this bad boy is to build! As always we have the free printable plans for ya! Just click HERE to download and print them. Then, you can follow along with the step-by-step below! This right here is all the lumber you need! 12 – 2x6x8 boards! We used our Ridgid Table Saw to rip the round edges off and made each board 5″ in width. This is not a necessary step but it will create a very smooth table top with no ridges. If you don’t rip them, make the base about 4″ wider. Then, we made our cuts! and the supports and the leg runners. After all of our cuts had been made, we used our Kreg Jig K5 to drill 1 1/2″ pocket holes into the boards. (Refer to our printable plans for the pocket hole placement). You can see that we have our Kreg Jig set to drill 1 1/2″ pocket holes. You can find the Kreg Jig that we use HERE on Amazon and you can watch our How to use a Kreg Jig video HERE. We started by assembling both legs. We used wood glue and 2 1/2″ pocket hole screws. The leg runners will attach to the legs and be flush with the edges of the legs. Make sure that your pocket holes face out so that you won’t see them once the table is done. Attach the runners while the table legs are upside down. Your pocket holes will face up and the runners will be flush with the outside of the table legs. Attach the runners with 2 1/2″ pocket hole screws and wood glue. Now, attach the supports between the table runners with wood glue and 2 1/2″ pocket hole screws. (Refer to the plans for the placement of the supports). While the spray paint was drying, we assembled the table top. Attach all of the planks with 2 1/2″ pocket hole screws and wood glue. Then, measure and cut the breadboards to fit the planked top perfectly. Attach the breadboards with 2 1/2″ pocket hole screws. Flip the table base upside down and center it on top of the table top. Attach the base to the table top with 2 1/2″ Spax screws. We prefer the star head screws and love using Spax screws because there is no need to predrill! You can find the Spax T-Star screws HERE on Amazon. Flip the table right-side-up and it’s ready for the finish! We used one coat of Dark Walnut stain on the table top. You can find the stain HERE on Amazon. Add some fall decor and you have yourself a table that will impress your guests! We found the cute fall decor and the table runner, for the centerpiece, at AtHome! There you have it friends! 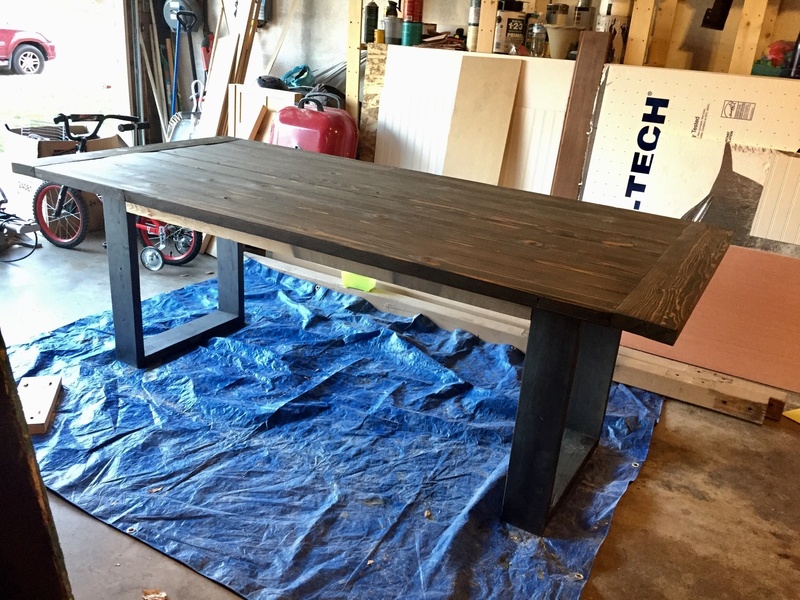 A DIY Rustic Modern Dining table that we built with only 12 2×6 boards, a few tools and had it done in one afternoon! We are ready to entertain for Thanksgiving in style! 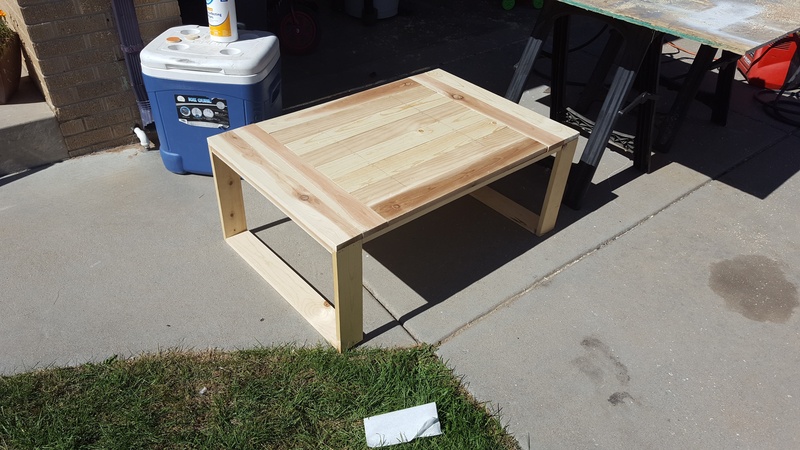 If you build one for yourself, make sure to tag us @shanty2chic on our social channels or upload it to your Reader’s Projects section of our website! Make sure to check the how-to video out below! Happy Building and Happy Entertaining! You can find the mirrors HERE! The Table Runner and Fall Centerpiece Decor can be found at AtHome! I was wonderingifbi wanted to make an 8 foot table how would you recommend modifying it so the legs can support the weight? Is this table pretty heavy and sturdy for outdoor use? 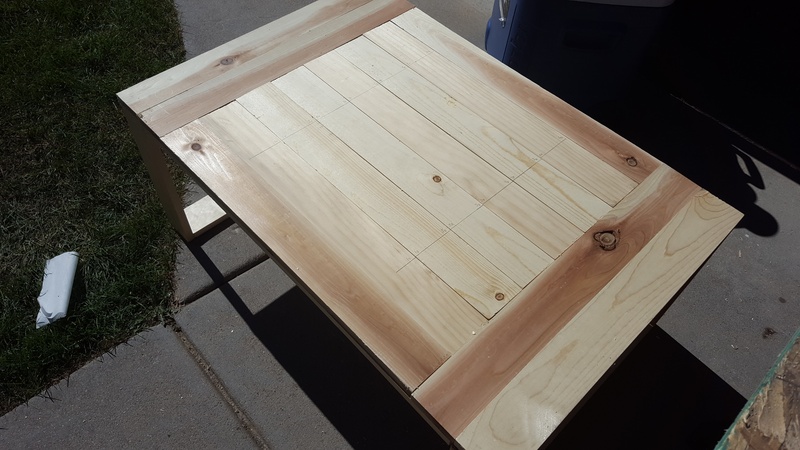 I would love to build this table for my outdoor patio in Arizona, but would love know if it has good weight to it for when we have windy days. Can anyone please tell me how far apart I need to space the pocket holes? Hi everyone. Is there anybody who has made this table for small spaces? I need for 4 places. Do you think the current size fits maximum of 6 chairs? I’m trying to download the measurements for the pocket holes however when I click the link it doesn’t show up. I’m able to download the plans for the wood measurements though. Any chair ideas for this table? 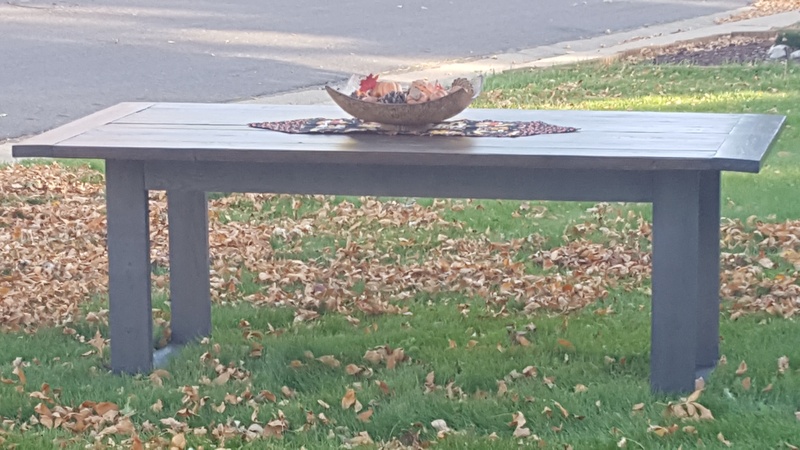 could this be used as an outdoor table if coated with poly? @shanty2chic:disqus I have purchased some lumber at Lowes, but they seem pretty damp. Unfortunately, I have cut them already, then realized I need to let them dry before putting them together. Is there a way to tell if the wood is dry enough to work with? Another question. I’m a total newbie. I only have a circular saw. Can I rip off the round edges with my circular saw? Do you have any suggestion for doing this? This is such an awesome table. Thank you for sharing! Although I don’t know where you guys live but here in NY those boards are $6 a piece so more like a $75 table. Still inexpensive for a full size table. Thank you! @shanty2chic:disqus which cuts would we increase by 4″ if we are not ripping the board to 5″? The overall width of the table would be inches so you would want the width of the bases to be 4 inches wider. Is there any wiggle in this table? I built something very similar for a coffee table, but the wooden legs caused a lot of wobble in the long direction of the table. I love this table, but want to make sure it’s solid enough – my dad love to put all of his weight on the table as he stands up! Thanks! I didn’t think there is any wiggle. I used HD screws in the legs and base as I wanted to make sure it was strong and sturdy. I feel like it is! Mine had a lot of wiggle. I just turned my runners 90 degrees and it is solid as can be now. I am a big guy (about 280 lbs) and I can put my weight on the table to stand up with no movement. I used the regular panhead screws. So the long runners have the 6″ side perpendicular to the table top, instead of parallel like in the original plans? That is correct. The way the runners attach in the plans is actually about the weakest way you join the boards together. Here is how the final product turned out. That is a good modification. Do you still have the three cross pieces giving the runners additional support? I love how yours turned out. How did you make the bench? Are the base/legs the same dimensions as the tables? Bases : 4 cuts at 16 inches, 4 cuts at 9 inches. Joined together the same was as the tables. (These are 2 x 6. 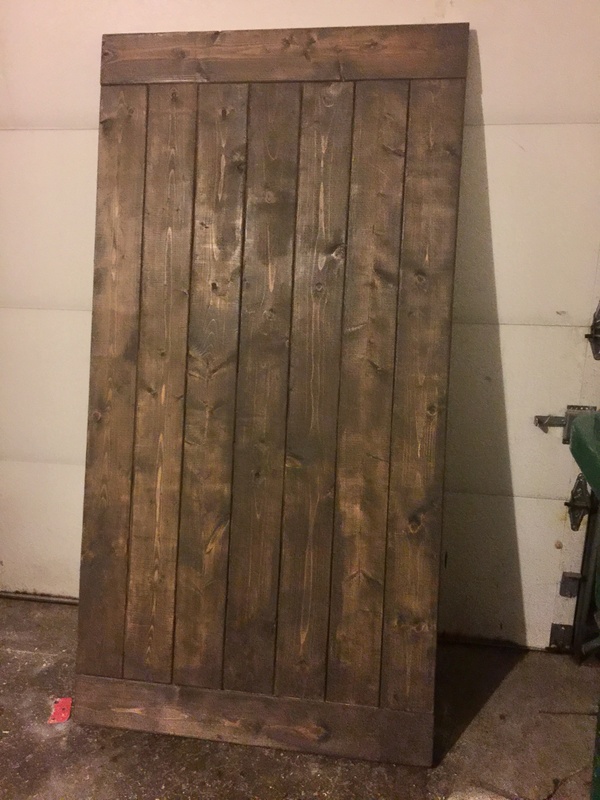 My wife will paint and stain this today. I just built this ben but the breadboard ends of the bench arent very strong. Any suggestions? I would center the leg basesunder where the breadboards connect. any chair idea to add? Ana White has some easy to build to chairs. 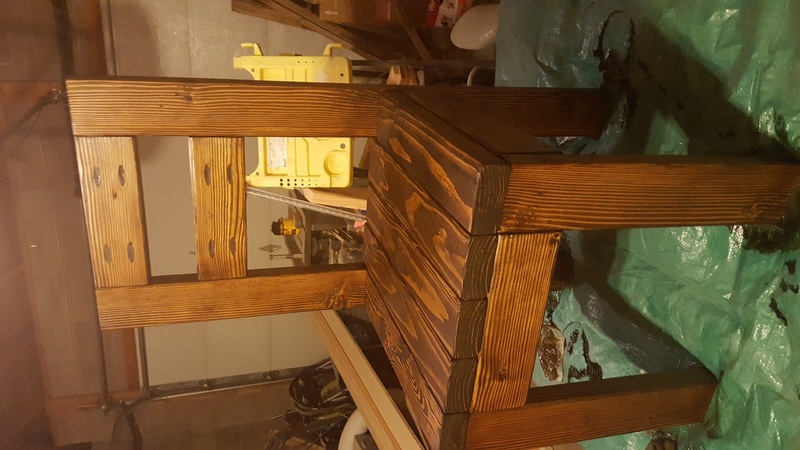 I just used my old chairs along with the benches I built. I’m sorry who is Ana White? Thank you! If you know of any other links that are good for DIY projects can you please let me know? omg! i was thinking same thing great job! only thing is how many charts fit lengthwise ? 2 or 3 i need to fit 2 only my space i limited. i really like this table and wish i could make it but unfortunately i can’t remove the round edges of 2x6s. as the only tools i own are a hammer screw driver a drill, and sander. lol. as a female its hard to buy tools. i was also thinking perhaps i can use 1 less 2×6 for the width of the table ? Hi! Can you share you plan for the bench? I love this and can’t wait to build this weekend! do you use the Kreg Jig HD and HD screws for the base for this or did you use normal pocket hole screws? Thank you. I am going to build the dining table this afternoon. It looks like a half day project or so. Did you rip the boards to 5 inches first? no, I did not. I don’t have a table saw, so I chose to skip that optional step! That was going to be my next question! It looks so great! I am glad to see I can skip that step and still achieve the same look! I just have to finish up a little bit of paint. Hi! I have a few questions…How many chairs were you able to fit around the table? Do you have issues with food getting into the grooves or is it tight enough? Also, is this possible to do without the kreg jig? We are very new at building! Lol! Thanks! Any special instructions, when not ripping and using 1 less board? How are you liking the table now days. I am planning on building it this Saturday. This may be a silly question but what boards from home depot do you use? When I go through the basic boards there all of them seemed warped or curvy. I get the straightest boards that I can but some projects still do not come out right and my tables come out wobbly after because of it. Considering this is a $50 table I assume they are using construction grade lumber. You’ll be lucky to find straight lumber at the big box stores and you’ll have to pick through lots of it to find any. I got the same thing and was just coming to tell them! I hope they can get it fixed soon, because I want to build it too! I just clicked it and the plans pulled up. Are you clicking where it says HERE? Oops! I just fixed it. Thanks!! yaiiii… Thank you so much!!! !